Gaza City (AFP) – A year ago, Ezzedine al-Baz’s decision to skip work and join tens of thousands at the first day of protests along the Gaza-Israel border nearly cost him his life. Baz, then 29, said he had been standing a couple of hundred metres from the border fence for only about a half an hour when an Israeli sniper’s bullet pierced his leg. “A full-blown escalation would obviously push the system again towards the edge of collapse,” said Gerald Rockenschaub, the World Health Organization (WHO) head in the Palestinian territories. MSF has treated more than 4,000 Plaestinians with gunshots wounds. Israeli forces’ use of live fire has come under heavy criticism, with Palestinians and rights groups saying protesters have been shot while posing little threat. With Gaza’s medical system overstretched, treatment outside the strip could ease pressure. Less than one in five permit requests have been approved by Israeli authorities, for those seeking to leave Gaza for treatment. “The Gaza health system suffers from long years of neglect by the Hamas terror organisation, which prefers to invest its citizens’ money in terror and military power,” it said. 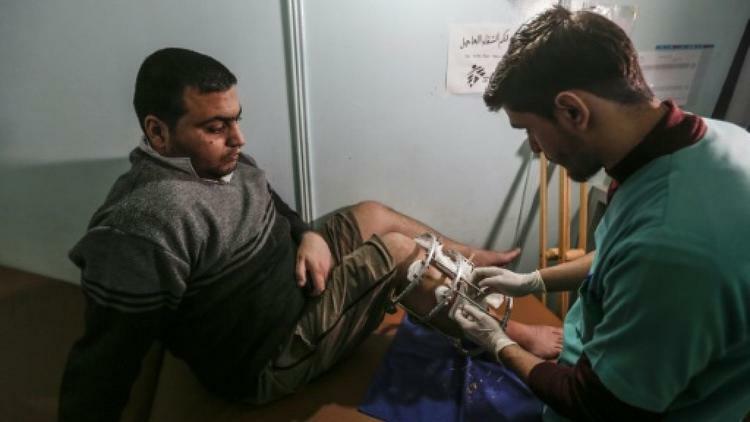 More than 8,000 operations for other often serious but not life-threatening conditions — such as gallstones or hip replacements — have been postponed in Gaza hospitals according to the WHO. WHO’s Rockenschaub said he recently met a nurse who walked miles to work each day as she didn’t have money for a bus. “Whenever we talk to health authorities in Gaza, even to individual physicians, many of them talk about their intention to leave,” he told AFP.